After watching Saturday Night Live the last few weeks, limericks and clerihews have been rattling around in my head. I thought it might be fun to write some limericks this week. 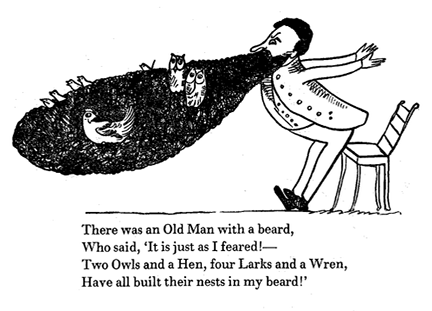 Limericks are humorous nonsense poems that were made popular in English by Edward Lear. Limericks not only have rhyme, but rhythm. The last words of the first, second, and fifth lines all rhyme, and the last words of the third and fourth lines rhyme. This means the rhyme scheme is AABBA. The rhythm of a limerick comes from a distinct pattern. Lines 1, 2, and 5 generally have seven to ten syllables, while lines 3 and 4 have only five to seven syllables. Here is an example from Lear's book. If you can't read the text, here's the limerick in the 5-line form usually seen today. You can read Lear's A Book of Nonsense online, which includes 112 limericks. I hope you'll join me this week in writing some limericks. If you feel politically inclined, that would be fun too. Please share a link to your poem or the poem itself in the comments. I hope you'll join me this week in writing a rhupunt. Please share a link to your poem or the poem itself in the comments. This month the poetry gang wrote villanelles with the theme of brevity or shortness. The villanelle is a nineteen-line poem with two repeating rhymes and two refrains. It is made up of five tercets and a quatrain. The rhyme scheme is aba aba aba aba aba abaa. The 1st and 3rd lines from the first stanza are alternately repeated so that the 1st line becomes the last line in the second stanza, and the 3rd line becomes the last line in the third stanza and so on. The last two lines of the poem are lines 1 and 3 respectively. I started poems on 4 different topics, but ultimately couldn't get away from politics. My apologies for that. It's too bad really, because some of the other ideas were interesting. I'm going to keep working on the poem built around Shakespeare's quote "brevity is the soul of wit." It was the first thing I thought of when I began brainstorming ideas for this form and I just couldn't get it out of my head. I also worked on poems about winter days and revising poems. Here's the poem I'm sharing today. I thought about calling it "The Relativity of Trump," but I couldn't bring myself to do it. I do hope you'll take some time to check out all the wonderful poetic things being shared and collected today by Penny Klosterman at Penny and Her Jots. Happy poetry Friday friends!